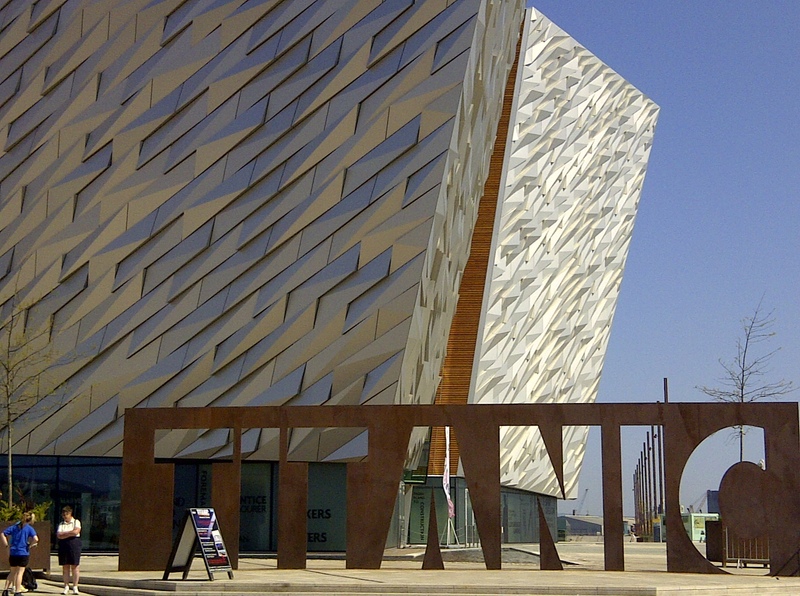 The new Titanic exhibition within a short space of time has become one of the key tourism attractions in Northern Ireland. Building work began on the project in May 2009 at a location less than 80 metres from where Titanic’s hull was launched; to its right is the original drawing office where she was designed and to the left is the River Lagan where she first set sail. To form the basement area of over 1-ha, 80,000 cubic metres were excavated, involving 10,000 truckloads of material being removed from the site. This was followed by the largest ever concrete pour on the island using of low carbon concrete to form its foundations – 4,200 cubic metres, circa 700 concrete lorry deliveries, one every two minutes for almost 24-hours. That’s a pretty large by any standard. I have been interested in visiting it for some time although my interest was more with the building than the exhibition. The first thing which strikes you on your approach to Titanic Belfast® are the four large angular hull shaped panels which make up the exterior clad in 3,000 individual silver anodized aluminium shards, the reflective surface make them appear even larger than their 27.5 metres. Inside the building it has a floor space covering an area of 14,000 sq.m. (150,700 sq.ft.) with 9 galleries of interactive exhibition space from which you get a sense of what Belfast was like back in 1912. Following that there is a dark ride which brings you on a journey to experience what it would have been like working deep in the ship’s hull with crews heating and banging in thousands upon thousands of rivets into the metal cladding on a daily basis and the incredible noise associated with that work. Later on the tour you find recreations of the ships decks and cabins. There is an extremely good wrap around screen which starts with recreated footage of what the working engine room might have been like and slowly ascends through the various decks of the ship. There are many interactive touch screens which gives the visitors an opportunity to looks various statistics related to the ship. Towards the end of the exhibition there is a cinematic theatre where you can sit and watch an underwater exploration recording of the Titanic on the sea bed. Not available on the public tour is a very plush conference and banqueting suite conference and banqueting suite with capacity for up to 1000 people. Overall I was more than impressed with the exhibition, a few small cribs there were no information leaflets available and we took the 11am tour. Nothing original of significance from the Titanic or anything salvage from the seabed. My other minor issue was the coffee could be much better. It took us about 2 and half hours to get around the entire exhibition which I suppose was reasonable value for the £12.83 sterling (16 euro) admission. Outside there were plenty of guides offering walking tours (we declined) which included a visit to the drawing rooms for the White Star liners. We managed to finish off our day before the sun went down with a visit to my favourite part of Northern Ireland, Giants Causeway and the coastline near Carrick-a-Rede bridge.